President Trump supports states rights for recreational and medical cannabis use, because voters (the people) approved policy measures for legalization efforts. The political polarization between Democrats and socially conservative Republicans play a crucial role in the struggle over the legalization of the recreational and medical use of cannabis in the United States. This common misconception of the lack of republican support for reforming marijuana laws needs to end as the public opinion for marijuana legalization continues to soar at a record high of 64% in Gallup's most recent update in October 2017.” In 2012, Colorado and Washington State residents revolutionized the United States’ first constitutional legislation to regulate recreational cannabis by approving Amendment 64 in Colorado and I-502 in Washington State. As a part of both referendums, any adult 21 and older can legally purchase cannabis from a retail operation. This historical policy measure altered discussion about criminal prosecution of cannabis offenders nationwide as Colorado and Washington State challenged existing federal prohibition of cannabis as a schedule 1 drug. Aside from President Donald Trump’s historic win in the November 2016 elections, recreational cannabis legalization was also the champion in drug policy reform. As of July 2018, 9 states legalized recreational marijuana and 30 states have medical marijuana programs. With the victory of President Donald Trump, many cannabis activists are worried about President Trump’s appointees of both attorney general, Jeff Sessions, and the Head of the White House Drug Commission, Governor Chris Christie. As Republicans, both Jeff Sessions and Governor Chris Christie notoriously are against marijuana legalization. These two appointees worry cannabis activists and cannabis patients from both sides of the aisle. Although there is a misconception that cannabis legalization is a democrat issue, many people forget that Republicans also voted to legalize recreational and medical cannabis in all 26 states. Cannabis legalization coincides with personal freedom through responsible use within the Republican fundamentals. By legalizing cannabis, Republicans need to understand that the free market of a legal cannabis industry will create jobs. As the cannabis industry skyrockets in states like Colorado, the state’s economy is benefiting from the influx of tourists, sick patients and families moving to the Colorado as property values increase, and jobs are being created within the industry from retail stores, consultants, and scientists. The sky is not falling in Colorado or Washington State despite what opponents feared from my own travels there. President Trump supports states rights for recreational and medical cannabis use, because voters (the people) approved policy measures for legalization efforts. According to a Washington Post article in 2015, Trump specifically states, “In terms of marijuana and legalization, I think that should be a state by state issue”. Veriheal previously reported in April of 2018 that there is also evidence that suggests President Trump's continuing support for lifting the federal cannabis ban and prosecution for those caught with marijuana despite Attorney General Jeff Session pre hysteria War on Drugs mindset. 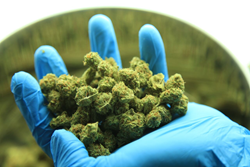 Veriheal connects patients with the resources that they deserve to gain access to medical marijuana legally. We aim to change the image of alternative medicine by pushing the traditional limits imposed on cannabis by creating an ecosystem that can seamlessly connect patients, doctors, and dispensaries.